A large-scale embedded solar array will be switched on at Toyota UK’s engine production centre at Deeside in North Wales. Almost 13,000 solar panels will provide up to 10% of all the electricity required for manufacturing at the site, which makes petrol and hybrid engines for Toyota Avensis and Auris models sold throughout Europe. The solar array, commissioned as a multi-million-pound project delivered by British Gas, will significantly reduce the site’s carbon emissions. It took three months to install the panels, supplied by Tata Power Solar, which cover an area that’s the equivalent of almost eight football pitches. 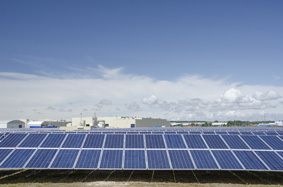 The facility can generate up to 3,475,000 kWh of electricity each year – enough to produce up to 22,500 car engines. The Toyota plant’s carbon emissions will fall by 1,800 tonnes a year, a figure matching the combined weight of 1,260 Auris hatchbacks. Established in 1992 and backed by a total investment of £700 million, the Deeside factory employs around 570 people, producing petrol and hybrid petrol engines for the British market and for export to Toyota production centres worldwide. 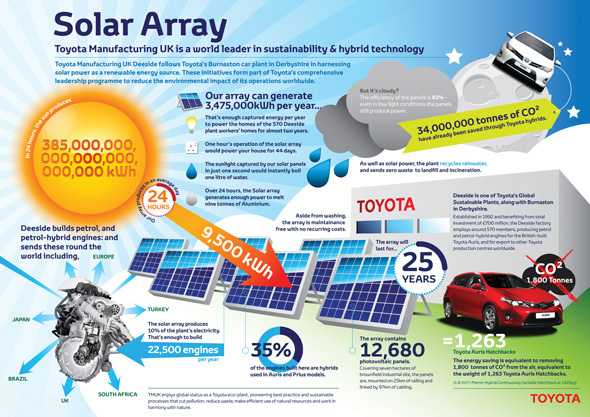 Toyota’s Burnaston factory in Derbyshire showed the way in harnessing solar power as a renewable energy source when it installed one of Britain’s largest solar arrays in 2011. The Deeside and Burnaston solar initiatives are part of Toyota’s leadership strategy to reduce the environmental impact of its operations worldwide. Toyota Manufacturing UK enjoys global status as a leading eco-plant, pioneering best practice and sustainable processes that cut pollution, reduce waste, make efficient use of natural resources and work in harmony with nature. Jim Crosbie, Toyota’s Deeside Plant Director, said: “The significant investment we have made in the new solar array marks a major advance for Deeside and Toyota Manufacturing UK in our mission to minimise the environmental impact of our operations, cutting carbon emissions and powering our production in a way that’s cleaner and more environmentally efficient. GCSE results are in… have you thought about a Toyota apprenticeship?